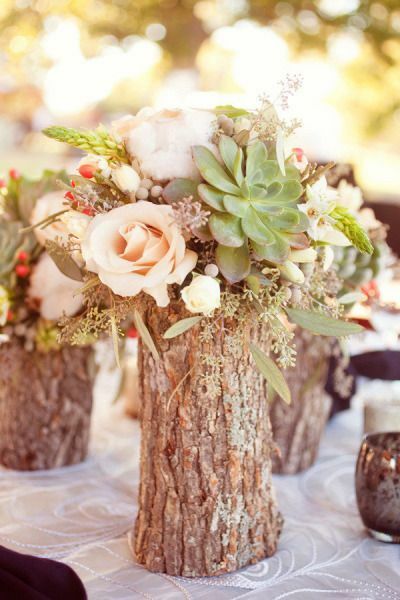 This is my favorite wood-inspired centerpiece, and it is sure to make a statement no matter what the event is! Find a log you like and enlist a “handy friend” or carpenter to smooth down the ends, and hollow out the center all along the log, or hollow out 3″ holes down the log, put in some moist potting soil and place flowers or even succulents for a naturally beautiful center piece. This is a great centerpiece for round tables. You or a trusty carpenter can saw down stumps of varying widths and heights to create this multi-dimensional look. Cluster them together, add votive candles and bud vases to complete the look. 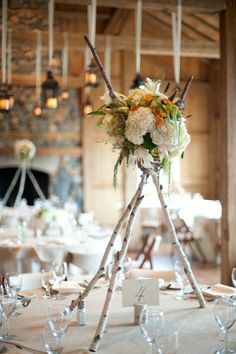 I suggest sticking with the similar colors of wood, so the centerpieces look cohesive. 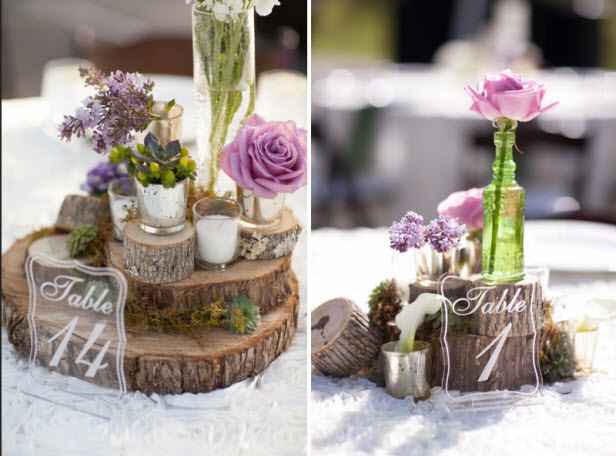 If you love the elegant simplicity of candlelit centerpieces, this may be right up your alley. 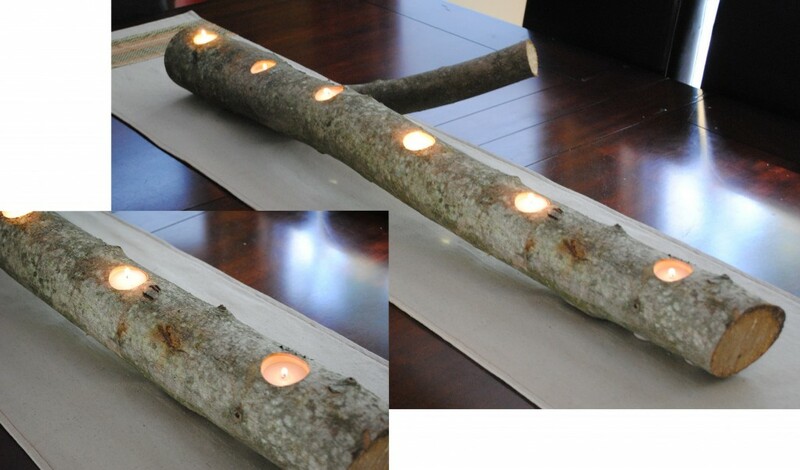 To create this centerpiece be sure to carve out the appropriate width of holes for your votive candles, I suggest following the detailed instructions on jennaburger.com. 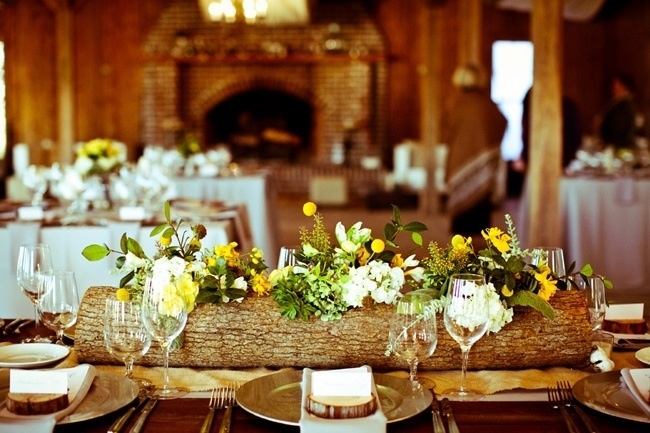 This look can be enhanced by adding moss and/or floral touches around the perimeter of the log. Your wedding is a once in a lifetime party! That being said you definitely don’t want it to be a party you’ll have to spend years paying off. Set up a budget, there are several wedding websites that make it easy for you, like this one. Here are 7 things you shouldn’t forget while you are setting up your budget. Gratuities – It is important to realize that although gratuities may not be mandatory with every vendor they are expected, and it ensures better service. Before the big day make sure to pull out cash for each of your vendors and place each one in an envelope, give the envelopes to your wedding coordinator so they can help alleviate the stress of you having to do this on the big day. Postage – This is one of the peskiest fees that are often overseen. 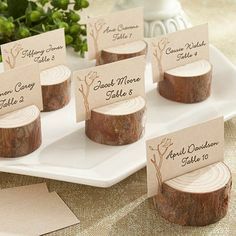 One way to cut these costs is to keep your invitations simple and chic, avoiding sending guests bulky invitations in boxes or odd shaped/sized envelopes. And be sure you take one complete invitation (including those little tissue papers, maps, etc.) to the Post Office and have them weighed, before buying your stamps! Gifts – Don’t forget to include gifts for your wedding party, parents and hostesses of your bridal showers. Each of these people have spent a lot of money and time for your wedding, so make sure you show your appreciation. Beauty Regimen – Many women want to keep their beauty regime on point when prepping for their big day. Whether you choose to visit the spa for regular facials, or buy a new cream to keep your skin silky soft, be sure to include these costs. Some of the standard things brides pay for are: massages to reduce stress, facial products or services, spray tans, teeth whitening, and even maintenance of hair color. All of this up-keep can cost big money, so budget appropriately, spend on those that are most important to you and find ways to save money on others. Welcome Bags – Welcome bags typically aren’t put down in the budget, depending on what you include this could be quite costly! Be sure to include information about the ceremony and reception and thank your guests for attending, all other items in the bag are up to you as budget allows. Dress Alterations – When brides go in to purchase their dress, they typically give their attendant a number of how much they’d like to spend on their gown, be conscious that alterations can dramatically change the overall cost of your dress. I have seen dress alterations vary, from a simple hem at $100 to – changes made to the bodice, hemming, bustle, etc.. $550. When purchasing your dress keep in mind what changes will be made and budget appropriately. Set up and Clean up Fees – Don’t forget to budget for when it’s all over. Many couples forget to allocate costs and staffers to take down all the decor that made your celebration so special. Talk to your venue and wedding coordinator to ensure all of this is taken care of. For more information be sure to visit us at:http://www.exceptionaleventstexas.com.